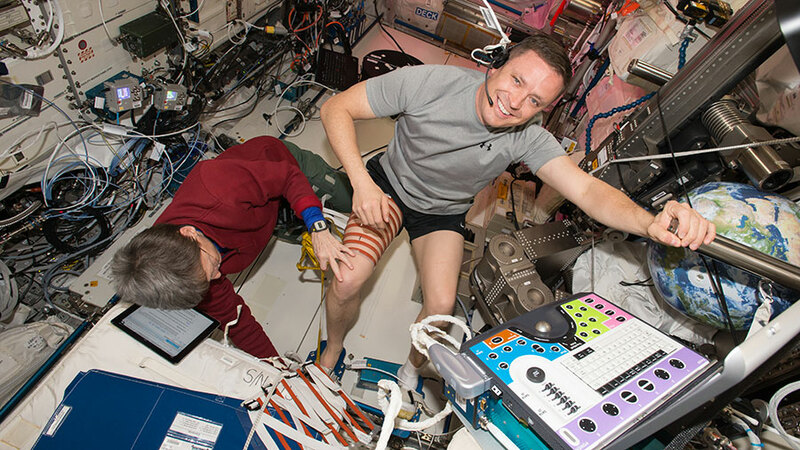 This week, Commander Peggy Whitson evaluated Flight Engineer Jack Fischer’s calf and thigh for the Sprint study to assess spaceflight-induced changes in muscle volume. Doctors are evaluating the effectiveness of high intensity, low volume exercise to keep astronauts healthy in space. Expedition 51 is wrapping up a week of ongoing research into how living in space affects an astronaut’s brain and vision. The International Space Station also boosted its orbit ahead of crew and cargo missions coming and going in June. NASA astronaut Jack Fischer strapped himself in a device for the NeuroMapping experiment today that tests how the human brain structure and function changes in space. The study also compares brain changes, motor control and multi-tasking when an astronaut is in a free-floating state. Doctors have noted how microgravity causes a headward fluid shift of blood and other body fluids. As a result, astronaut’s experience face-swelling and elevated head pressure. The Fluid Shifts study is exploring a way to offset the upward flow using unique suit known as the Lower Body Negative Pressure suit. Commander Peggy Whitson wore the suit today and underwent ultrasound scans and eye checks to help scientists determine its effectiveness against lasting changes in vision and eye damage. The space station is orbiting a little higher above Earth this week to prepare for the departure of two crew members on June 2. The SpaceX Dragon is due to launch June 1 and arrive at the station three days later. Mission managers are working a plan dependent on an on-time Dragon launch that could see the Orbital ATK Cygnus cargo craft depart in early June or mid-July.